New York, NY, January 31, 2019 - In partnership with New York Sea Grant (NYSG), the New York State Department of Environmental Conservation (DEC) today announced nearly $570,000 in ocean research grants awarded to three investigative teams including Stony Brook University (SBU), CUNY York College, and the Wildlife Conservation Society. The teams will work to identify the biodiversity of the offshore ecosystem of the New York Bight and investigate the species and uses of New York’s ocean environment. "Understanding our oceans is of utmost importance to our coastal communities," added NYSG Interim Director Kathy Bunting-Howarth. "Sea Grant is pleased to support these projects and to bring the results to life with the vast array of coastal stakeholders who rely on these resources." Through New York State’s comprehensive 10-year Ocean Action Plan (OAP), supported by the Environmental Protection Fund’s Ocean and Grant Lakes funding, the state has prioritized dedicated research to inform long-term monitoring programs and to improve science-based understanding of how interrelated components of the ocean ecosystem function off New York's coast. Researchers Chris Gobler, Michael Frisk, Lesley Thorne, SBU School of Marine and Atmospheric Sciences (SoMAS), will investigate the impacts of ocean acidification on shellfish, crustaceans, fish, and zooplankton in the New York Bight and possible connections to oceanic eutrophication. Ocean eutrophication begins with the increased load of nutrients to coastal waters and can stimulate an explosive growth of algae (algal blooms) that depletes the water of oxygen when the algae die and are eaten by bacteria. Investigators Bassem Allam, Robert Cerrato, Emmanuelle Pales-Espinosa, Kamazima Lwiza, SBU SoMAS, will study environmental impacts to this shellfish fishery, as well as the implication for other marine life species regime shifts occurring in the New York Bight with an increase in global temperatures and potential ocean acidification. 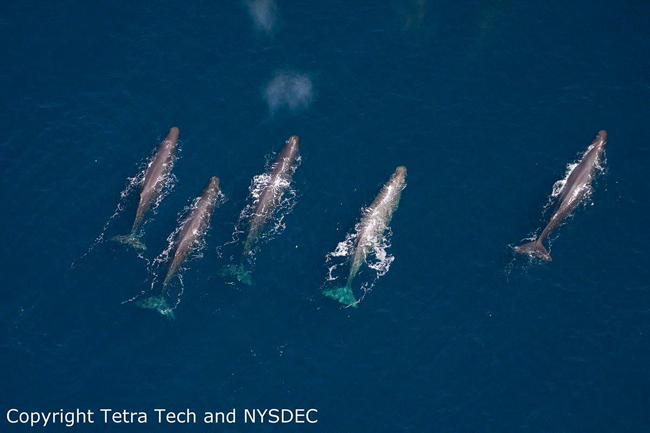 Assessing the rich and biodiverse marine life of the New York Bight and the submarine Hudson Canyon will begin to characterize the offshore ocean ecosystem and the creatures that inhabit or visit New York ocean waters. An additional focus on outreach to communicate these findings at the New York Aquarium is the focus for researchers Elizabeth Alter, CUNY York College; and Howard Rosenbaum, Merry Camhi, Wildlife Conservation Society. New York’s long-understudied inshore and offshore ocean waters contain a wealth of information on the health, biodiversity, and resiliency of marine organisms and their ocean habitat. To achieve New York's goals in ensuring the ecological integrity of the ocean ecosystem and the goods and services it provides, the state must first explore the questions pertaining to the ecosystem and collect data needed to inform future decisions on how we use the ocean environment. Maritime commerce, commercial and recreational fishing, tourism, and other recreational business are key components to New York’s economy that rely heavily on the health of the state’s ocean and estuarine ecosystems. Understanding the current baseline conditions of the ocean ecosystem and how these are changing is a key factor as new and traditional uses of the offshore area expand with new technologies and new resources. It is imperative to measure environmental changes occurring with ocean ecosystems to understand the scope of climate change in the New York Bight, as well as the new uses designed to reduce those impacts. New York State Senator Todd Kaminsky, Chair of the Senate Environmental Conservation Committee, said, "The investment in cutting-edge research for preserving and protecting our oceans for future generations is incredibly important. I applaud the New York State Department of Environmental Conservation and the Governor's Office for their efforts on this initiative." As a partner with DEC in the OAP Research Program, NYSG’s mission is to help New York’s diverse coastal communities respond to rapid economic and environmental changes. NYSG has been funding research for nearly 50 years on issues of critical importance to New York’s coastal communities and stakeholders. Sea Grant is partnering with DEC in administering the research awards. There's more information via the DEC Web site on New York’s OAP and OAP’s Ocean Monitoring Project. Connect with DEC on: Facebook, Twitter, Flickr, YouTube and Instagram.